I remember the first time I went to my local gym and saw a new sign, hastily hand drawn and posted, announcing that cell phones were no longer allowed in the change rooms. It took me a minute or two to get it, but I finally figured it out. Ahh..they come with cameras now. There are two dimensions to this that I wanted to briefly explore. First of all, with digital cameras everywhere, businesses have to be more careful about the face they show to the public, because it’s likely that if their bad side is showing, there’ll be someone there to snap a picture. Consider the example of one Kohl’s store in Dallas. 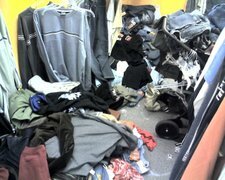 A shopper visited the store in the post Christmas season, found a store that looked like a tornado just ripped through it and just happened to have a cell phone with a camera and a fairly well read blog. It gets worse. His post happened to catch the eye of Seth Godin, who has one of the most read blogs on the Web. The result? A PR nightmare for Kohl’s. And this can happen anywhere. The next time a character at Disneyworld alledgedly sucker punches a guest, you can count on a camera being nearby. It’s enough to make your average PR Director retire to a remote Caribbean isle, one without internet connections.